May | 2011 | Perfect Storm Warnings! House Assistant Democratic Leader Jim Clyburn, the highest-ranking African-American in Congress, on Wednesday blamed most of President Barack Obama’s political problems on racism. Clyburn, who’s from South Carolina and is a close ally of the president, offered his views in response to a question about Obama’s re-election prospects next year. He didn’t talk about the president’s controversial speeches, decisions, or even gaffes. Instead, Clyburn brought up Obama’s race as the first black president. He doesn’t remember the hate and verbal assaults levied on George W Bush while he was in office and even after he left. He is apparently not aware of all of the attacks and threats directed at Sarah Palin. And I’m sure he has no idea of the amount of hate and vitriol that is spewed at Glenn Beck, Sean Hannity, Rush Limbaugh and Laura Ingraham. How does it relate to them? They obviously do not have the same skin color. No, for them, it is part and parcel for being in the public arena in today’s extreme America. For Rep Clyburn it is not skin color at all. He is just another Democrat who uses race as a weapon to keep the country divided. It is in their history to do so and it is wrong. President Obama recently gave what was billed as a major policy speech on the Middle East at the U.S. State Department. 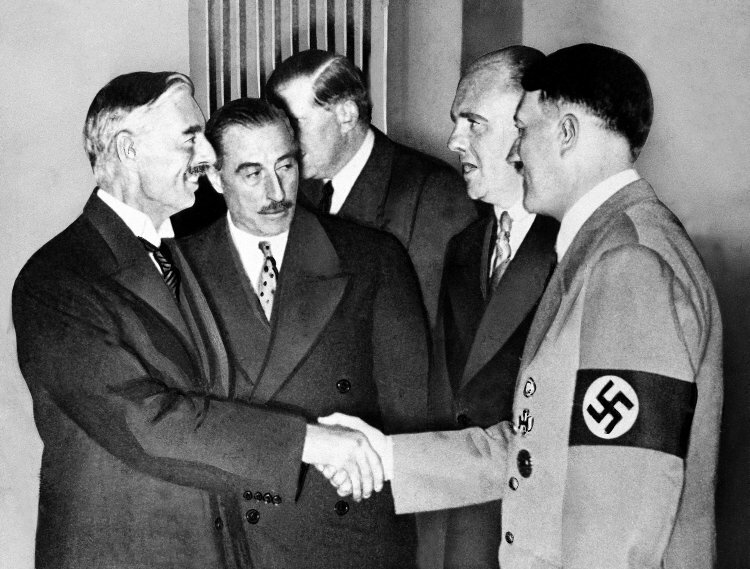 The speech was about 45 minutes long, but most of the discussion following the speech centered on the last few minutes of the speech, where Barack Obama had what can only be described as a Neville Chamberlain moment. Barack Obama in an obvious attempt to appease Palestinians, stated in his address, “ The United States believes that negotiations should result in two states, with permanent Palestinian borders with Israel, Jordan, and Egypt, and permanent Israeli borders with Palestine. We believe the borders of Israel and Palestine should be based on the 1967 lines with mutually agreed swaps.” This being said without notifying Israel beforehand and prior to any other negotiations taking place. Israeli Prime Minister Binyamin Netanyahu promised to present his vision for an Israeli-Palestinian peace agreement in a speech before a joint session of Congress, but said that there can be no return to the indefensible 1967 borders. A few days later, Obama left on a European trip where he planned to seek a joint Middle East agreement with David Cameron, insisting that a Palestinian state should be based on pre-1967 borders. The issue was to be raised in private talks between the two men during the state visit by Obama and his wife to London. Obama has already secured the political backing of the United Nations, European Union and Russia. A US official, speaking on condition of anonymity, said endorsing the pre-1967 ceasefire line was done in the hopes of dissuading the Palestinians from going ahead with their plan for recognition of an independent Palestinian state in the United Nations in September. Palestinian success in obtaining a unilateral declaration of statehood at the UN would leave Israel increasingly diplomatically isolated in the region and the world. The United States also opposes unilateral action, which would put Washington in the awkward position of having to vote against Palestinian statehood. While the Israeli-Palestinian issue is important, the other parts of Obama’s speech were at least as important and at least as troubling for anyone hoping for stability in the area. Obama said, “There must be no doubt that the United States of America welcomes change that advances self-determination and opportunity.” He spoke of a set of core principles that he said has guided our response to the events over the past six months. Those principles include the opposition to the use of violence and repression against people of the region; support for the right of free speech, freedom of peaceful assembly, freedom of religion, equality for men and women under the rule of law, and the right to choose your own leaders; and support for political and economic reform in the Middle East and North Africa. Indeed, Obama seemed indignant that “in all too many countries, calls for change have thus far been answered by violence.” It should not be surprising to a national leader that Kings and dictators might feel compelled to quell protests that they feel threaten their regimes. President Obama has no idea who will be in charge in Tunisia, Egypt or Libya come the end of the year. He has no idea what their beliefs or policies are or will be. Yet he is promising billions of dollars worth of aid and investments in the area. He is promising a Trade and Investment Partnership Initiative in the Middle East and North Africa without any clue who he is offering it to. While I support the idea of using the principles that our nation believes in and is based on as an example to those who desire similar freedoms in their lands, I do not believe we should be overtly involved, either directly or through agitation, in regime change for the sake of regime change. The U.S. Border Patrol found an entrance to a tunnel on May 2 in an abandoned building in Nogales, Arizona which runs 250 feet beneath the U.S.-Mexican border. Authorities in Arizona said although they’ve found dozens of tunnels in Nogales, since the 1990s, this one is by far the most sophisticated. The tunnel is complete with electricity, water pumps and ventilation. Chief Border Patrol agent Randy Hill said those who were building it had chiselled through solid rock and installed lighting and other equipment. The tunnel lies 15 feet beneath the ground and is three feet wide and five feet high. The state of Arizona straddles a heavily trafficked route for powerful Mexican cartels smuggling marijuana, cocaine, heroin and methamphetamines into the U.S.
At least eight tunnels have been found running beneath the streets on both sides of the border since October last year. From the beginning of the U.S. military intervention in Libya, the Obama administration has cited the 1973 War Powers Act as the legal basis of its ability to conduct military activities for 60 days without first seeking a declaration of war from Congress. The military intervention started on March 19; Congress was notified on March 21. Those 60 days expire today. Congressman Dennis Kucinich, Democrat of Ohio, said Monday that even though previous presidents had sidestepped Congress, Mr. Obama’s decision was still a “serious” abuse. Ever since the Korean War, presidents of both parties have ordered military action without Congressional authorization. It is time to end that practice. Colonel Qaddafi’s forces, of course, posed an imminent threat to Libyan nationals engaged in the recent civil war in that nation. How did the Colonel or his army threaten Americans? Secretary of Defense Robert Gates said that Libya did not pose a threat to the United States before the U.S. began its military campaign against the North African country. In Tunisia and then in Egypt, regimes were toppled by protests. Libya is convulsed not by protests but by war. Not a war of aggression, not a war with foreign armies violating national borders and thereby violating the basic tenets of international law, but a civil war. With no imminent threat to the United States, the president has no legal right to launch strikes on a foreign country without authorization from the American people, through their elected representatives in Congress. This nation should disengage its military forces from combat operations in the Libyan theater and discontinue supporting the military forces of other nations conducting operations there. As the U.S. military campaign in Libya approaches the 60-day mark this Friday, six Republican senators wrote President Obama asking if he will comply with the War Powers Act, which says Congress must authorize action that lasts more than 60 days. As of 17 May 2011, armed forces from the United States will have been involved in military combat operations in Libya for 60 days. By that date, President Obama is required by statute to withdraw US Forces from Libya and cease all unpleasantness. Or, he could ask Congress to give him a resolution authorizing the use of force. “Friday is the final day of the statutory sixty-day period for you to terminate the use of the United States Armed Forces in Libya under the War Powers Resolution. Last week some in your Administration indicated use of the United States Armed Forces will continue indefinitely, while others said you would act in a manner consistent with the War Powers Resolution. Therefore, we are writing to ask whether you intend to comply with the requirements of the War Powers Resolution. We await your response,” wrote the GOP senators Wednesday. The GOP senators said they believe the president already violated part of the War Powers Act – which says the president’s constitutional powers allow him to only deploy troops into “hostilities” with a declaration of war, specific authorization from Congress or a national emergency caused by an attack on the U.S.
With a deadline of May 20th, the Senators can expect to hear nothing from the President on the matter. This administration has already shown that there are laws they support and laws they do not. This will be one that they do not. Easily one of the most contentious issues in the Israeli-Palestinian conflict and the Israeli-Arab conflict at large is the status of Jerusalem. The city is holy to three religions: Judaism, Christianity, and Islam, and is claimed by at least two national movements to be its capital, Israel and the Palestinians. Israeli Arabs vehemently oppose any settlement – such as an exchange of land between Israel and the Palestinian Authority – which would transform them into Palestinian subjects, denying them Israeli citizenship. A sizeable number of Jerusalem Arabs prefer to remain under Israel’s sovereignty, according to a January 12, 2011 public opinion poll conducted by The Palestinian Center for Public Opinion. The poll was commissioned and supervised by the Princeton-based Pechter Middle East Polls and the NY-based Council on Foreign Relations. Since 1967, Jerusalem Arabs – within Israel’s municipal lines – have been permanent Israeli residents and Israeli ID card holders. Therefore, they freely work and travel throughout Israel and benefit from Israel’s healthcare programs, retirement plans, social security, unemployment, disability and child allowances, and they can vote in Jerusalem’s municipal election. According to the January 2011 poll, which was conducted by Palestinians in Arab neighborhoods far from any Jewish presence, 40% of Jerusalem Arabs would relocate to an area inside Israel if their current neighborhood were to be transferred to the Palestinian Authority. Only 27% would relocate to the Palestinian Authority if their neighborhood were to become an internationally recognized part of Israel. It is highly unlikely that the results of this poll or even the opinions of Jerusalem Arabs in general will have any impact on the form and content of negotiations between Israel and the Palestinian Authority. Indeed, the Palestinian Authority, the leaders of other Palestinian nationalist movements like Hamas, Islamic Jihad, and PFLP, the Arab states, and the international community at large have already cast their lots as to what are the “legitimate demands” of the Palestinians. Mumia Abu-Jamal, sentenced to death in 1982 for the murder of a police officer, was granted a new sentencing hearing by a US appeals court last month, although his original guilty verdict was upheld. The court in Pennsylvania ruled that Abu-Jamal, a former Black Panther who has languished on death row for nearly 30 years, must have a new sentencing hearing within the next six months. The same court that issued last month’s ruling suspended Abu-Jamal’s death penalty sentence in 2008, leading to three years of court challenges that including an intervention by the US Supreme Court. The Pennsylvania appeals court set aside Abu-Jamal’s death sentence over procedural irregularities during his trial, finding that the jury mistakenly had been led to believe that it could not consider mitigating factors against a death sentence. Shortly after 3:55 a.m. on December 9, 1981, Officer Danny Faulkner, a five year veteran of the Philadelphia Police Department, made a traffic stop at Locust Street near Twelfth Street. The car stopped by Officer Faulkner was being driven by William Cook who had been driving the wrong way on a one-way street. Falkner pulled behind Cook’s car, radioed for police backup, approached Cook’s vehicle, and ordered the driver to get out of his car. While Faulkner handcuffed Cook, Wesley Cook (now known as Mumia Abu-Jamal), who was behind the wheel of a taxi parked across the street, suddenly got out of his vehicle ran toward Faulkner and shot him in the back. Danny turned and drew his own gun and was able to fire one shot that struck Abu-Jamal in the chest, wounding but not killing him. The wounded officer then fell to the pavement. Mumia Abu-Jamal stood over the downed officer and shot him four more times at close range, once directly in the face..
Mumia Abu-Jamal was found still at the scene of the shooting by officers who arrived within seconds. The murderer was slumped against the curb in front of his brother’s car. In his possession was a .38 caliber revolver that records showed Mumia had legally purchased months earlier. The chamber of the gun had five spent cartridges. A cab driver, as well as other pedestrians, had witnessed the brutal slaying and identified Mumia Abu-Jamal as the killer both at the scene and during his trial. The body of evidence placing Mumia Abu-Jamal at the scene of Faulkner’s killing was overwhelming. In addition to three eyewitnesses who testified that Abu Jamal was the killer, his brother William Cook has never testified that Abu Jamal was innocent and Abu-Jamal himself never once claimed his innocence at his own trial. Two policemen and one hospital security guard testified to the court that while Abu Jamal was being brought into the hospital following the altercation with Faulkner, he shouted repeatedly, “I shot the mother f—er, and I hope the mother f—er dies.” The bullet that the doctors removed from Abu-Jamal’s chest came from Officer Faulkner’s gun. The bullet in Faulkner’s brain came from Abu-Jamal’s gun. Abu-Jamal and his supporters claim that the guilty verdict against him was predetermined because he was an African-American and a member of the radical leftist Black Panthers movement. He is presently incarcerated in the maximum-security State Correctional Institution Greene, near Waynesburg, Pennsylvania.